I chose the pull-up for my first exercise breakdown because it may very well be my favorite exercise out there. I truly believe everyone, especially athletes, should be incorporating them into their routine regularly. Particularly for you grapplers out there. The benefits of this simple exercise are vast (some might even claim…limitless?). Pull-ups build a very functional kind of strength; that is to say, the strength translates effectively to sports movements as well as everyday activities. 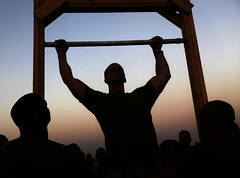 Pull-ups are the king of upper body movements. If you could do only one exercise for your upper body I would recommend pull-ups, with push-ups coming in as a close second. They are considered a compound movement because they do not isolate one specific muscle group (like bicep curls, for example). 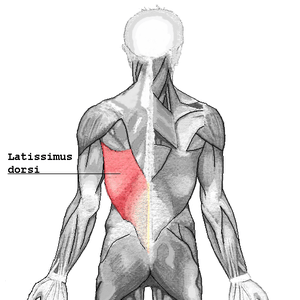 The primary worker in the movement is the Latissimus Dorsi muscle which is one of the main muscles in the back. Several other muscles play a big role in the exercise as well including forearms/grip, biceps, posterior deltoids, and lower trapezius. One of the great things about this exercise is that it uses your own bodyweight as resistance and requires little equipment. All you need is a pull-up bar and if you don’t have one then you can use basically any horizontal type beam or even a tree branch potentially. First step is to grip the bar around shoulder width apart. Traditionally the pull-up is performed with an overhand grip but if you’re looking to focus more on your biceps then an underhand grip works well and is generally called a “chin-up”. Performing the exercise is easy enough, you pull yourself up so that your chin is at the bar level and then go back down with minimal movement or swinging in the lower body. A good visualization when performing the pull-up is to think about pulling the bar down to you rather than yourself to the bar. Also, be sure to control both the concentric and eccentric phases (upward and downward movement) of this exercise because quality is more important than quantity. Tip: Don’t relax too much at the bottom position. This can over-stretch the muscles, making them weaker when you perform the next repetition. It can also put a great deal of stress on your shoulder joints.